With Traumatic Brain Injuries, Soldiers Face Battle For Care Even when traumatic brain injury is diagnosed in soldiers, many find they have to fight to get adequate treatment. Medical records show brain-injured soldiers at Fort Bliss have been told that their main problems are psychological, not related to blasts. Some soldiers have turned to clinics outside the military to get help. 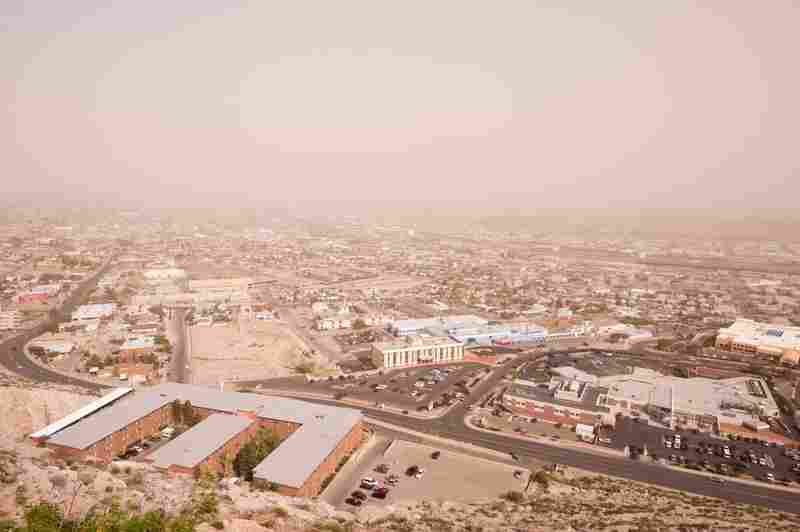 At the rapidly expanding base in Fort Bliss, Texas, along the U.S.-Mexico border, the military is racing to build new homes for 10,000 additional soldiers. Cranes stack prefabricated containers like children's blocks to erect barracks overnight. Bulldozers grind sagebrush desert into roads and runways. Just down the street from the construction boom squats a tan, featureless building about the size of a convenience store. Completed nearly a year ago, it remains unopened, the doors locked. Building 805 was supposed to house a clinic for traumatic brain injury, often called the signature wound of the wars in Iraq and Afghanistan. Instead, it has become a symbol for soldiers here of what they call commanders' indifference to their problems. "The system here has no mercy," said Sgt. Victor Medina, a decorated combat veteran who fought to receive treatment at Fort Bliss after suffering a brain injury during a roadside blast in Iraq last June. Since the explosion, Medina has had trouble reading, comprehending and doing simple tasks. "It's struggle after struggle." Previously, NPR and ProPublica reported that the military has failed to diagnose brain injuries in troops who served in Iraq and Afghanistan. Mild traumatic brain injuries, which doctors also call concussions, do not leave visible scars but can cause lasting mental and physical problems. At Fort Bliss, we found that even soldiers who are diagnosed with such injuries often do not receive the treatment they need. Most specialists say it is critical for patients who show lingering effects from head trauma to get intensive therapy as soon as possible. In the civilian world, such therapy is increasingly seen as the best way to minimize permanent damage, helping to retrain the mind to compensate for deficits. Yet brain-injured soldiers at Fort Bliss have had to wait weeks and sometimes months just to get appointments with doctors, medical records show. 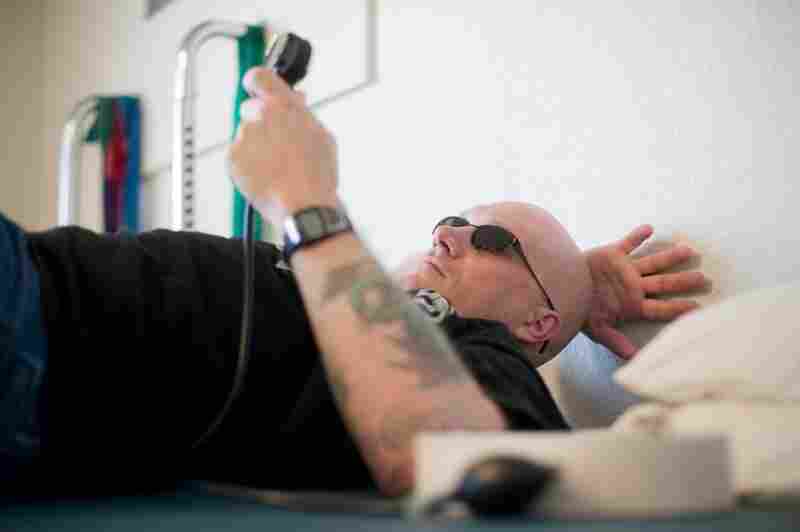 Many have received far less therapy than is typical at well-regarded civilian clinics. In some instances, Fort Bliss medical officers have suggested that the soldiers are malingerers or that the main root of their cognitive problems is psychological. Sgt. Brandon Sanford was a dog handler who was in two roadside blasts in Iraq. After two years of seizures, headaches and a loss of memory, he is now an inpatient at Mentis. He spends eight hours a day doing rehabilitaion exercises. 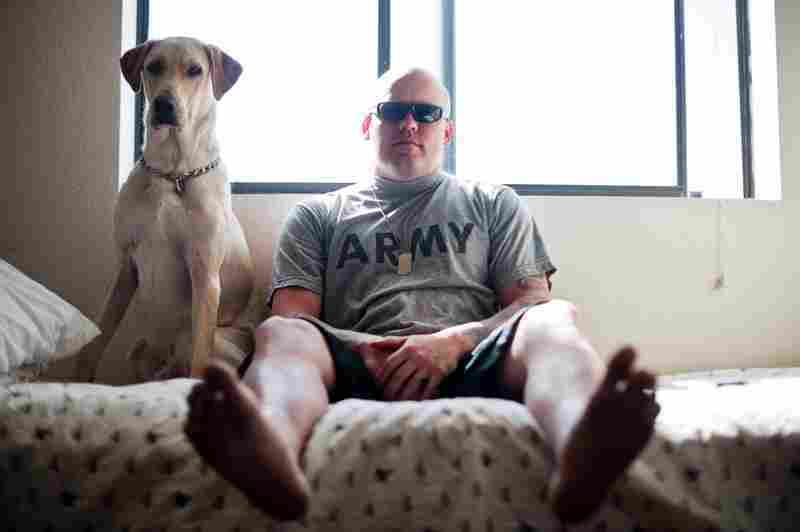 He is seen here with his service dog, Harley. William Fraas checks a pressure gauge during exercises for his lower back. He can no longer drive or remember simple lists of jobs to do around the house. "When someone has a brain injury, you can't see it, but it's still serious," he says. Administrator Jose Huerta stands in the main hallway at Mentis. The center combines physical and cognitive rehabilitation to help patients reintegrate into society. Director of Nursing Johnny Dennis formerly served in the military. He now supervises staff at Mentis who assist with therapy and take patients on outings designed to make them more comfortable in social settings. Sgt. Victor Medina was hit by an IED while on patrol with his convoy in Iraq in June 2009. After fighting for a diagnosis and treatment from the military, he is finally being treated for a traumatic brain injury at Mentis, a private neuro-rehabilitation facility in El Paso, Texas. Mentis, seen here in the lower left corner, offers physical, occupational and speech and language therapy. Many of its patients are war veterans suffering from traumatic brain injury. Brandon Sanford performs balance exercises with physical therapist Tess Tiscareno. Originally diagnosed with PTSD by the neurologist at Ft. Bliss, he now recieves specialized care for a brain injury at Mentis. 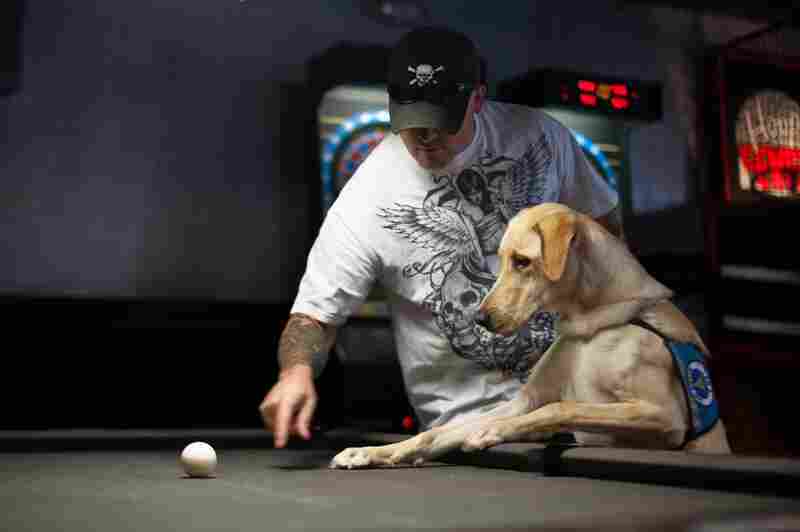 Sanford's service dog, Harley, takes interest in a cue ball during a social outing with other Mentis patients. 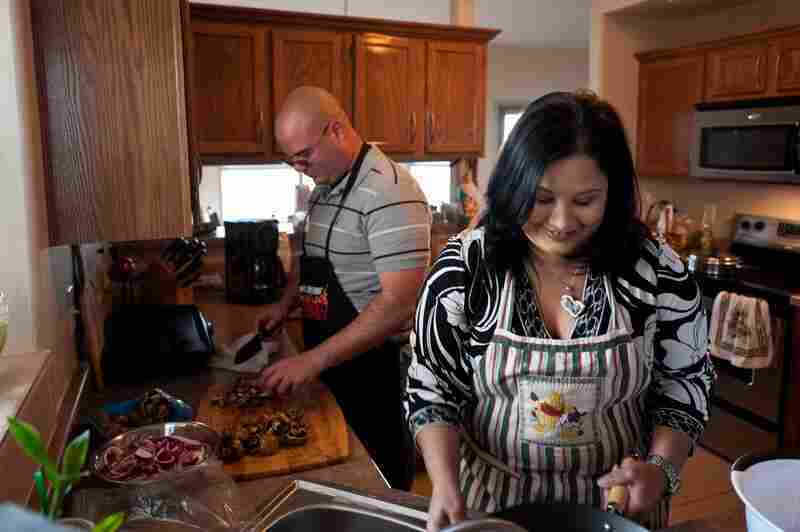 Victor Medina prepares dinner with his wife, Roxana Delgado, at their home in El Paso. Delgado was instrumental in fighting to get care for Medina, who now is improving after starting treatment at Mentis. "Here you have all these soldiers looking for help, and it was just getting swept under the carpet," said Sgt. Brandon Sanford, 28, a dog handler who survived two roadside blasts in Iraq. Sanford endured a year of balance problems and mental fog before Fort Bliss officials sent him for cognitive therapy. "I served my country. I've got an injury to prove it." It is impossible for civilians to know how Fort Bliss' care for brain-injured soldiers compares in quality or scale to that of other bases. Base officials would not give NPR and ProPublica data on how many soldiers are being treated there and the Pentagon would not provide this information for bases elsewhere. Did you or a loved one suffer a mild traumatic brain injury (concussion) while serving? ProPublica and NPR want to hear your story. Tell us about your experience with TBI. Fort Bliss — the third-largest base in the U.S. military and a vital nerve center for deploying and returning troops — is supposed to be among the best. In 2007, the Pentagon designated it as one of 20 bases nationally that would develop augmented treatment programs for traumatic brain injury. Yet while base commanders have spent more than $3 billion to expand and improve Fort Bliss over the past several years, they have directed just $5 million to facilities and clinicians to treat TBI. The program had no full-time director until October 2009. A neuropsychologist was hired only recently, after a two-year search. Fort Bliss' commander, Maj. Gen. Howard Bromberg, declined repeated requests for an interview. Col. James Baunchalk, the base hospital's commander, acknowledged that the TBI program had encountered some delays, but said that it now had 12 clinicians — four full-time and eight part-time — who were delivering comprehensive care. "I honestly believe that we've done a good job of meeting the needs for the community," Baunchalk said. He promised in April that Building 805 would open by the end of May, saying they were just waiting until computer cabling was installed. Apparently, they missed their deadline. As of early June, the clinic to screen soldiers for traumatic brain injury had not opened its doors to a single patient. Traumatic brain injuries are among the most common wounds sustained in Iraq and Afghanistan. Shock waves from bombs can pass through helmets and through the brain. Secondary trauma can occur when soldiers are thrown up against vehicles or walls, shaking the brain again. Officially, the military says about 150,000 soldiers have suffered some form of brain injury since the wars began. But a 2008 Rand study suggests the toll is much higher, perhaps more than 400,000 troops. The most common type are so-called mild traumatic brain injuries. Most people recover quickly from such injuries, but studies have shown between 5 percent and 15 percent of patients may suffer long-term problems. NPR and ProPublica interviewed more than a dozen soldiers at Fort Bliss who are among that so-called miserable minority. All were diagnosed by military doctors with at least one mild traumatic brain injury. All had persistent symptoms, ranging from headaches and vertigo to difficulties with memory and reasoning. They described the bewildering ways in which their injuries had changed them. A sergeant who once commanded 60 men in battle got lost in a supermarket. A soldier who once plotted sniper attacks could no longer assemble a bird house. Most of them did not want their names used, for fear of harm to their military careers. All felt the treatment they received was inadequate. At leading neurocognitive rehabilitation centers, some patients with mild traumatic brain injury often receive three to six hours a day of therapy for months from teams of highly trained specialists. By contrast, many soldiers at Fort Bliss attended two to four hours of cognitive treatment per week. For some soldiers, weeks passed by with little or no treatment. The therapists who provided the soldier with speech and occupational therapy for their brain injuries sometimes had only minimal training in cognitive rehabilitation, records show. Staffing shortfalls also meant soldier had long waits before beginning rehabilitative therapies. While clinical research is still developing, the consensus recommendation of a group of military and civilian experts convened by the Pentagon last year was to provide rehabilitation therapy as promptly as possible. "The longer you go without therapy, the greater likelihood there is of falling into what I would call a mental disuse syndrome, where the brain is not being used at the same level," said Keith Cicerone, a leading rehabilitation researcher and the director of neuropsychology at the JFK Johnson Rehabilitation Institute in New Jersey. The brain "is in essence going to develop bad habits." Sgt. Raymond Hisey, 32, a convoy driver in the 1st Armored Division, survived a roadside blast in Iraq in July 2009. He remained in the field, but endured constant headaches and balance problems. His short-term memory suffered and he struggled to think of words to express himself. When he returned to Fort Bliss in October, he was diagnosed as having suffered a mild traumatic brain injury and was prescribed several courses of therapy. But a speech therapist cancelled several appointments, he said, and he clashed with the occupational therapist. Hisey was suddenly left without any treatment at all for his symptoms. "You just get lost in the system," he said. "I could have pushed more, sure. But people kept saying it gets better over time. I thought I was just losing my damn mind, to be honest with you." Fort Bliss is supposed to provide treatment to troops at smaller bases in the surrounding area. But one such soldier who developed headaches and balance problems after working on a mining detail in Afghanistan was told that no therapists could make regular trips to see him. Instead, the soldier, whose base was about an hour away from Ft. Bliss, was given antidepressants, which he did not take. He recently deployed for a second tour. "As much as the military is making of TBI and the effects it's having on the soldiers and their families, I think for something as big as Fort Bliss, there'd be more people" to treat it, said the soldier, a specialist who did not want his name used for fear of damaging his career. "I was told there were no resources, no facilities." Baunchalk, the hospital commander, said he had never heard such complaints from soldiers or their spouses. Soldiers were often reluctant to seek care, he said, because they perceived a stigma attached to traumatic brain injury. "It's tough for them to step forward and say ... I need some help," he said. "I don't think we have that many soldiers who have fallen through the cracks." Several soldiers told NPR and ProPublica, however, that they and their families had reached out to base commanders, sent e-mails to generals throughout the Pentagon, and even written to members of Congress, pleading for care. When their efforts proved futile, they felt abandoned. Nobody paid attention, they said, to a soldier with an injury that nobody could see. "No one listens to the soldier," said Sgt. 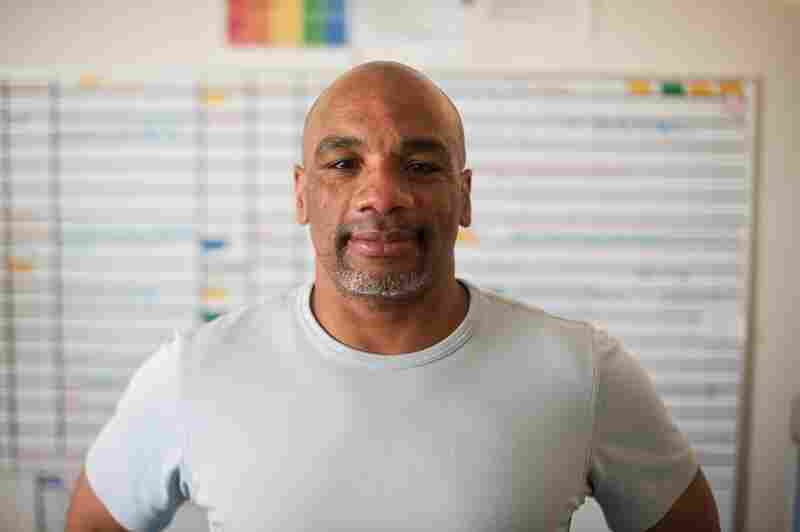 William Fraas, an 18-year military veteran and Bronze Star recipient who struggled for nearly two years to get help for problems with his balance and vision. "They are there and they are crying for help." 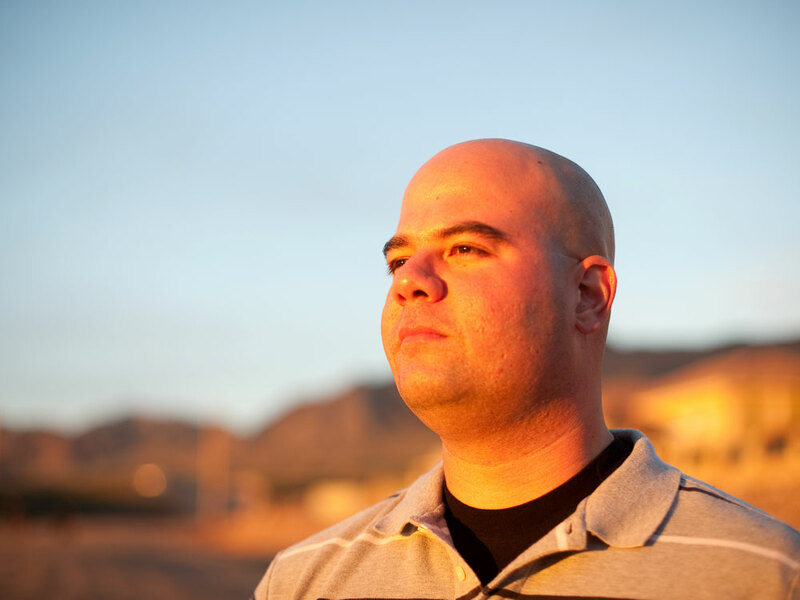 Fort Bliss soldiers struggling with the effects of brain injuries were often sent to Capt. 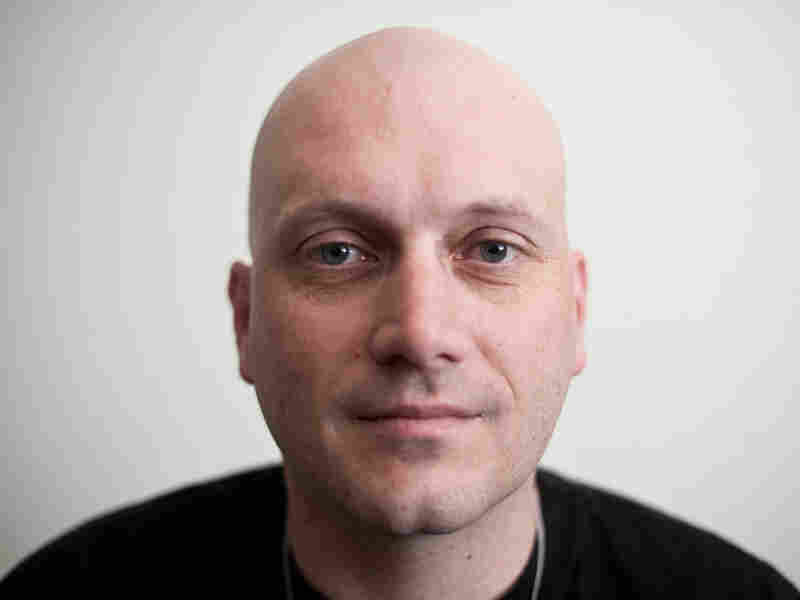 Brett Theeler, the base's sole neurologist. Theeler, records show, sometimes blamed psychological disorders rather than blast wounds as the likely source of soldiers' cognitive problems. Sgt. Victor Medina suffered brain damage when an IED hit his truck in Iraq. Even after he was diagnosed with a traumatic brain injury, he found he had to fight to get adequate care. A convoy commander in the 121st Brigade of the 1st Armored Division, Sgt. Victor Medina can see the moment he suffered his invisible injury. He was rumbling down a highway in southern Iraq June 2009 in a convoy of fuel, ammunition and supplies. Just behind him, in another armored troop carrier, one of Medina's soldiers was videotaping. Suddenly, the screen shakes. Black smoke jets into the air. Noise, swearing, confusion erupts. A roadside bomb had exploded directly beside Medina. Metal slag ripped through his vehicle's heavy armor, destroying radio equipment and blowing open Medina's door. Outwardly, Medina did not appear seriously injured. But in the weeks and months that followed, his mind began to fail him. He slurred his words, then started stuttering. An avid reader, he struggled to get through a single page. A punctilious soldier, he began showing up late for missions. 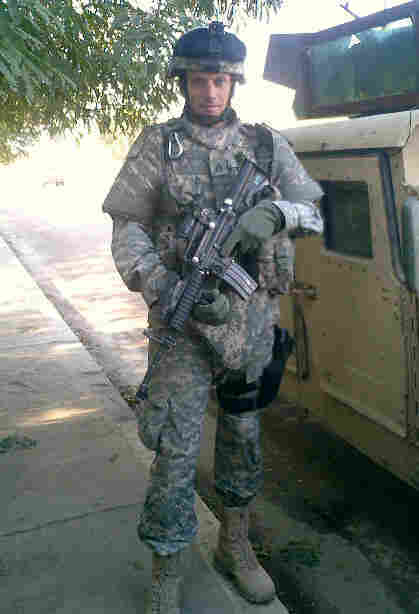 Medina was sent to Germany in August, where Army doctors diagnosed him as suffering from a traumatic brain injury. But when he returned to Fort Bliss for treatment, he and his wife, Roxana, found themselves fighting for care. Medina had his first appointment with Theeler a month after his return to Ft. Bliss. Afterwards, Theeler wrote that Medina had "multiple cognitive symptoms including poor concentration, short-term memory loss, and difficulty multi-tasking." Theeler said those symptoms were "possibly" related to lingering effects from his concussion, but were "likely" caused by "chronic headaches" and "anxiety." He wrote that Medina's stuttering was probably caused by anxiety, too. After a follow-up session with Medina in December, Theeler wrote: "I am concerned that he may be slipping into a cycle of playing the sick role." He pointed to the fact that Medina was using crutches — apparently unaware that a physical therapist had asked Medina to use the crutches because of back pain. To Medina, 34, a tall, broad-chested man with an intense stare, Theeler's words were insulting. Once praised by superiors for his leadership abilities, Medina worked relentlessly to overcome the staccato stutter that had made him difficult to understand. He was fighting to get better, fighting to remain in the Army. He said he felt was being labeled a liar. "You have all these values that you live for and fight for. And you go to the medical side and you don't see those values," Medina said. "I can understand being injured by insurgents. But I can't understand being injured by my own people." Other soldiers had similar experiences with Theeler. By the time Spec. Ron Kapture got to Fort Bliss in July 2009, he had suffered six concussions in which he was knocked unconscious from blasts, according to medical records and his own recollections. He was suffering headaches on a daily basis. He noticed that he could no longer do simple mental tasks. Before joining the Army, Kapture had gone to vocational school to learn cabinet making. After returning from Iraq, he struggled to put together a bird house with his son. "It took us about a month," said Kapture, 28. "I could build a whole living room full of furniture in a day seven years ago. It took me a month to build a bird house. That is frustrating stuff." Brandon Sanford performs balance exercises at Mentis while physical therapist Tess Tiscareno watches. Five months after his return, Kapture finally got an appointment to see Theeler after making repeated requests. Theeler noted that Kapture had a history of "mild concussions," but blamed his cognitive problems on "chronic headaches, sleep disorder and underlying mood anxiety disorders and depressions," records show. Kapture received counseling and medication for post traumatic stress disorder, or PTSD, but his problems with memory and concentration persisted. He had planned to make the Army his career, but became so embittered at the handling of his care that he is applying for a medical dismissal. "If that's the best help they ... can give us, then God help us all," Kapture said. "If that's the best they have to offer, I feel sorry for the guys coming home." In an interview at the base, Theeler declined to comment on individual cases, even in cases where soldiers had signed a waiver of their privacy rights. He said, more generally, that he understood why soldiers like Medina and Kapture were frustrated. Mild traumatic brain injury can be difficult to pinpoint as a cause for soldiers' problems since there are no readily available biological markers to indicate that a concussion has occurred, he said. Theeler said he concentrated on treating soldiers' symptoms regardless of the cause. Soldiers "say, 'Sir, what's wrong with me?'" Theeler said. "We're honest. I say, 'I don't know what's wrong.' This is an area that we're working very hard at to get our hands around . I don't know the answers." Some doctors and soldiers at Fort Bliss said medical commanders have placed a higher priority on treating post-traumatic stress disorder, a psychological condition, than on mild traumatic brain injury. As evidence, they point to the fate of two clinics. While Building 805 remains unopened, the base has poured money and effort into an experimental PTSD clinic that has attracted widespread attention within the military, including a visit from Defense Secretary Robert Gates. Known as the Restoration and Resilience Center, the clinic offers intensive, six-month-long treatment for chronic PTSD sufferers, including controversial techniques such as reiki, in which practitioners hover their hands over patients' bodies to improve the flow of "life energy," according to a pamphlet distributed at the center. Brain injuries and PTSD sometimes share common symptoms and co-exist in soldiers, brought on by the same terrifying events. Neuropsychologists said that treatments for the conditions can differ, however. A typical PTSD program, for instance, doesn't provide cognitive rehabilitation therapy. Someone with nightmares associated with PTSD might be prescribed sleep medication, which could leave a brain-injured patient overly sedated without having a therapeutic effect. One doctor at Ft. Bliss said that base commanders' focus on the PTSD clinic resulted in soldiers not getting adequate treatment for brain injuries. "The way our philosophy is in this hospital ... we took away their belief that they truly have something," said the doctor, who did not want his name used for fear of retaliation from commanders. "I don't think we gave them the opportunity to heal and that's what I find really disgusting." Some soldiers said they spent months receiving PTSD treatment while their cognitive problems went unaddressed. William Fraas is seen in his room at Mentis in El Paso. Fraas is a Bronze Star recipient who survived several roadside blasts in Iraq. He can no longer drive, or remember simple lists of jobs to do around the house. Sgt. William Fraas, 38, the sergeant who was awarded the Bronze Star With Valor, served three tours in Iraq, helping to train the Iraqi soldiers as part of the 101st Airborne Division, 320th Field Artillery. He was given his medal after rescuing an Army major and six Iraqi soldiers pinned down by gunfire. Driving in his Humvee, he used to keep track of the roadside bombs with a black grease pencil on the windshield. After 10, he stopped counting. 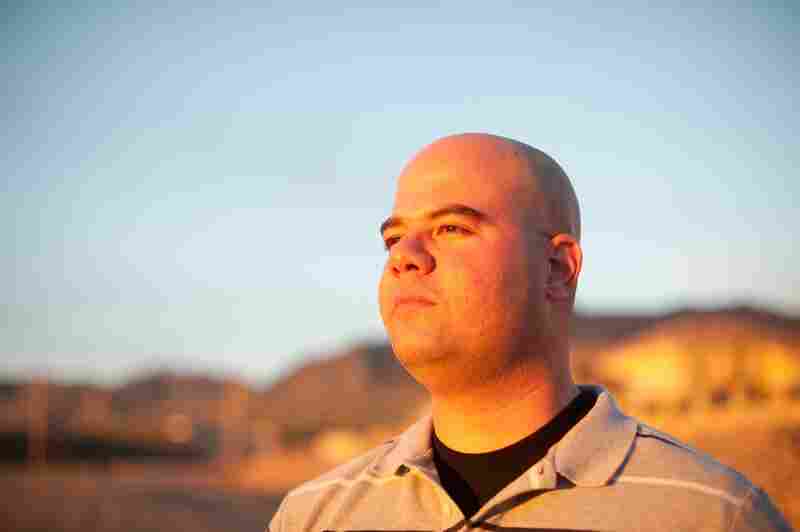 When he was sent home to Fort Bliss in 2008, he was diagnosed with PTSD and entered the experimental clinic. He spent eight months there before being cleared to return to active duty. But Fraas realized he was still having problems. He was constantly dizzy. He had debilitating headaches. He would call his wife when driving, so she could keep him oriented and awake. He began having blackouts. Once, he awoke to find his 12-year-old son struggling to lift him after he collapsed in front of his home computer. "They have these meetings for PTSD. But nowhere did they tell you anything about TBIs. We had no idea what was going on," he said. "It feels like my head is loose. Like my brain is loose. Like it's rattling inside my head." Finally, last summer, Fort Bliss doctors sent him to see a physical therapist at the base to improve his balance. But the appointments were irregular. And with his inability to drive, he had trouble getting around the sprawling base. A case manager who was supposed to coordinate his care asked one of Fraas' friends if he was faking it. A second case manager never even contacted him. After putting nearly 20 years into the military, he was stunned. "I could not get help. I called and called and called. I was hurting," he said. "It was just terrible. I'm a senior non-commissioned officer and I couldn't get help. I couldn't help anywhere." Some Fort Bliss soldiers have discovered that if they protest long and loud enough about their care, base commanders occasionally will pay to send them for help — outside the military. On a hot afternoon earlier this spring, Sgt. Brandon Sanford was digging a small trench in the black soil of a rose garden at Mentis, a private neurological rehabilitation facility perched on the mountains just outside of El Paso. He was installing an irrigation drip line as part of a therapy program designed to help him follow instructions. He set in one line, then covered up the trench. Then, looking down, he suddenly realized that he had failed to install the second drip line he was holding in his hand. It was a typical problem for a brain-injury patient. Concentration deficits can make even simple tasks complex and confusing. Sanford immediately began pulling up the first line, digging again. "That can be frustrating," the therapist overseeing the exercise said sympathetically. "Never," said Sanford cheerfully. "I ate my Wheaties this morning." Almost two years ago to the day, Sanford, a dog handler working with the 4th Infantry Division, was inside his Stryker troop carrier near Taji in central Iraq when a bomb exploded. The blast sent Sanford and his dog, Rexo, hurtling against the walls. Both were awarded the Purple Heart for shrapnel wounds they received in the explosion. Although dazed, Sanford shrugged off the headaches and dizziness he experienced and continued working. When Sanford returned to Fort Bliss in January 2009, he began having seizures, along with continued headaches and balance problems. He saw the base neurologist, Theeler, who diagnosed him as having "shaking syndrome," medical records show. He entered the PTSD clinic, received counseling and was released, but was still so mentally foggy he couldn't understand his 10-year-old son's math homework. His wife would open the cupboard where they kept cleaning supplies and find that her husband had put the milk carton next to the bleach. Sanford's wife and mother badgered military commanders unrelentingly until, nearly a year after his return from Iraq, they finally sent him to Mentis. There, Sanford is an in-patient: he spends eight hours a day, five days a week, on rehabilitation exercises. He goes on weekly outings to help him navigate the noise and confusion of public spaces, such as shopping malls. And he practices real-world tasks, like following cooking recipes — or laying out plans for a garden. Today, Sanford said that he is able to finish making meals more quickly. He can now perform two tasks at once, instead of only one. He is getting better at managing his own medications and his balance has improved. "You can only do so much sitting inside a hospital. It was like pulling teeth from a tiger to try to get in here. Once I got in here, it was like a whole new ray of light." Eric Spier, Mentis' medical director, said he has asked the military to send him more patients. But base commanders have sent only a few dozen in almost three years. "I've made sure to tell everyone I can tell that I'm ready to help, but that's all I can do," Spier said. The base has not sent "very many. It's surprisingly few." Fraas and Medina now attend sessions at Mentis. They praised the facility, but expressed disappointment that they had had to go outside the Army to receive help. Medina started in February. The staff at Mentis say his reading and concentration abilities are improving. His growing optimism is apparent in the blog he has started to chronicle his recovery. "I might be slower right now, but I think it's all going to get better and I want to go back to what I love doing, which is soldiering," Medina said. "It's what I love to do."